A private spaceship being proposed by a commercial space company in Virginia to carry astronauts has been given a name steeped in mythology: Prometheus. 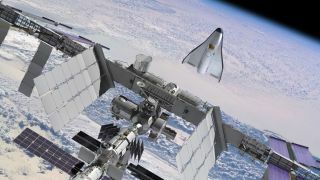 The veteran aerospace company Orbital Sciences unveiled the official name for its space plane design via Twitter Feb. 1. The spacecraft, which Orbital Sciences is hoping to use to taxi NASA astronauts to and from low-Earth orbit, is the company's bid to fill NASA's astronaut transportation needs after the space agency retires its space shuttle fleet this year. The name is in keeping with Orbital Sciences' Greek mythology theme: The company has rockets called Pegasus, Taurus and Minotaur, for example. Prometheus was the Titan who stole fire from Zeus and gave it to humans. Orbital Sciences chose to unveil the name via Twitter partly to help build up its nascent presence on the microblogging site, and partly out of playfulness, a company spokesman said. "It's just for a little bit of fun, on the Twitter side," said vice president of corporate communications Barron Beneski. Prometheus would be the second spacecraft under development by Orbital Sciences to serve the growing commercial space market. The company is building unmanned Cygnus spacecraft and Taurus 2 rockets as part of a NASA deal to provide cargo deliveries to the International Space Station. Prometheus is Orbital Sciences' proposal under the second phase of NASA's Commercial Crew Development program (CCDev-2), which aims to advance the crew-carrying capabilities of American private spaceflight firms. NASA began soliciting proposals for CCDev-2 in October and could make funding available in March, NASA officials have said. Orbital Sciences announced in December that it had submitted a proposal. Prometheus would be a "blended lifting body" craft that launched atop an expendable rocket and landed back on Earth via a runway, company officials have said. The vehicle looks somewhat like a miniature space shuttle. Prometheus would ferry four astronauts initially, Beneski said, but further development could expand the seating capacity to six. The vehicle could help shuttle astronauts to and from the International Space Station as well as provide a variety of transportation services for commercial activities in low-Earth orbit. While Prometheus remains a proposal at the moment, it's not a start-from-scratch design, Beneski told SPACE.com. "We're proposing to continue the work we've been doing with NASA for the past decade," he said. "And we hope to make this concept a reality." Prometheus isn't the only space vehicle Orbital Sciences has in the works. Like the private firm SpaceX– which has a $1.6 billion deal with NASA for cargo services – Orbital Sciences has a deal with NASA, under the agency's Commercial Orbital Transportation Services program (COTS), to help resupply the space station. Once the space shuttle fleet is retired, NASA will rely on Russian Soyuz spacecraft to ferry cargo and crew to the space station for the near future. But over the longer term, NASA wants U.S. companies such as SpaceX and Orbital Sciences to shoulder much of the load. Under its $1.9 billion COTS contract, Orbital Sciences will make eight supply flights using the company's Cygnus capsule and Taurus 2 rocket. But before it begins those supply runs, Orbital must make one successful demonstration flight. The company is on track to launch a Cygnus aboard a Taurus 2 and dock it with the space station sometime toward the end of 2011, Beneski said. "We still have a lot of work to do," Beneski said. "But we're aiming to carry out that mission this year." You can follow SPACE.com senior writer Mike Wall on Twitter @michaeldwall.